All songs written by Tyler Spencer. All songs recorded and engineered @ The Space Station by Martin M. ‘Take Off Your Clothes’ and ‘Nuclear War (On The Dancefloor)’. Produced by Jim Diamond. 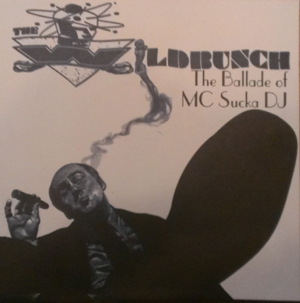 ‘The Ballade of MC Sucka DJ’ produced by Martin M. Mastered by Jim Diamond @ Ghetto Recorders. Cover art based on original art by Gomez. Design and layout by Martin M and Mojo Frezzato. Thanks to Andy and Patti and Good-Time Rollo. Special thanks to Virgil Yulansky (we don’t want him).